Thanks to Dole Sunshine for partnering with me for this post! All the opinions and creativity are solely my own. 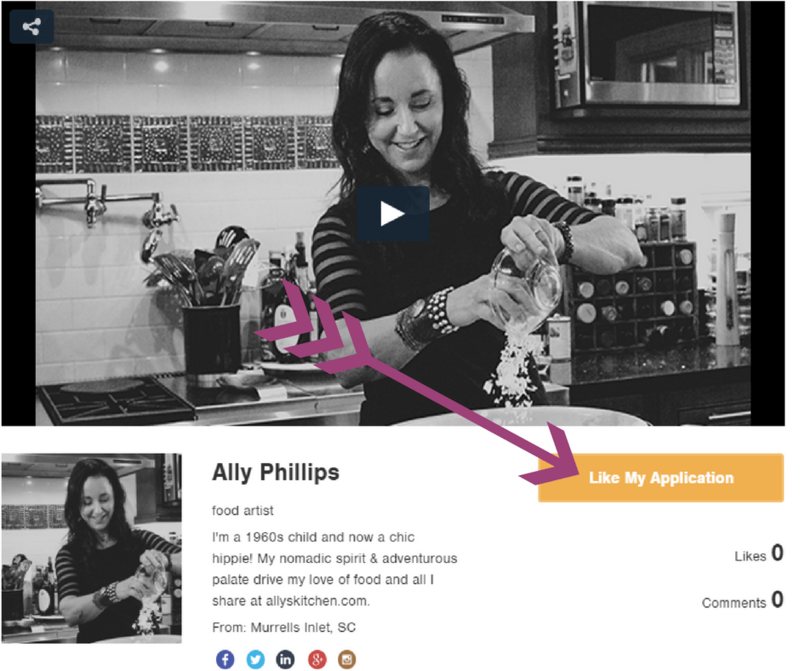 For a full disclosure, click here! There are sooooooo many things I’m loving about this new product, Fruit n’ Spice Chili Lime Mango Chunks, from Dole Sunshine! First of all, the packaging, all BPA free, is just so festive and cool. It’s like ‘sunshine’ on the bag that just makes me want to use the product. There are two other varieties in this line, Fruit n’ Lime Honey Lime Pineapple Chunks and Fruit n’ Spice Cinnamon Apple Slices. My brain is swirling with all the things I can do with these freshly frozen products! 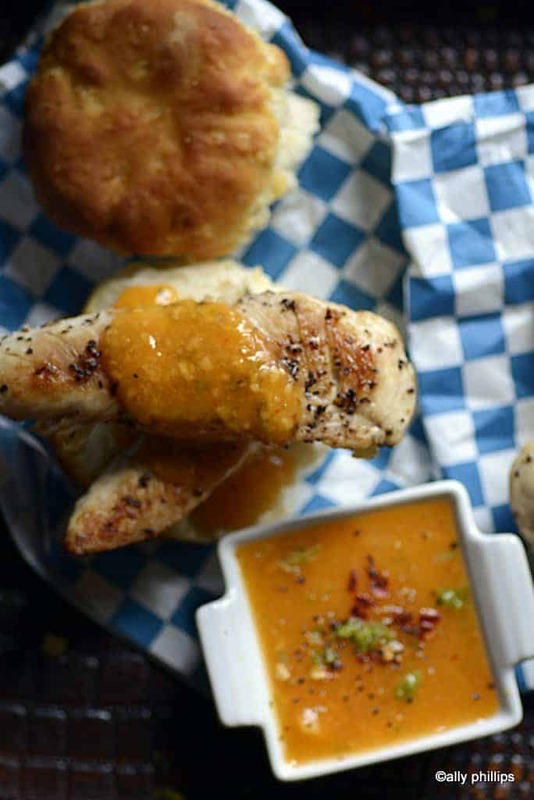 This recipe for mandarin mango chili lime chicken n’ biscuits is so simple. It’ll be a go to on busy nights or weekend breakfasts and brunches. 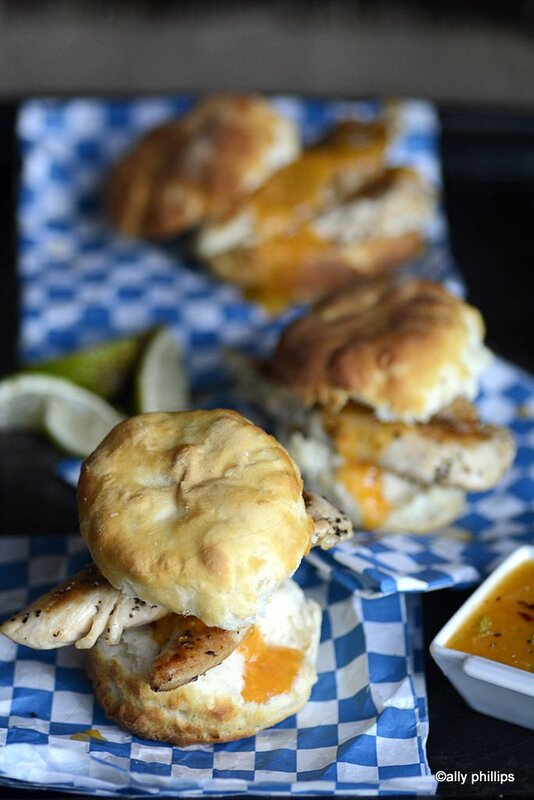 With the lime mango chunks I knew I wanted to create something for our chicken n’ biscuits. Something different for the sauce. Something that would have both a spicy and refreshingly fruity taste. So, I also used Dole Sunshine’s mandarin oranges in lime gel. Perfect for that touch of sweet without being overpowering. 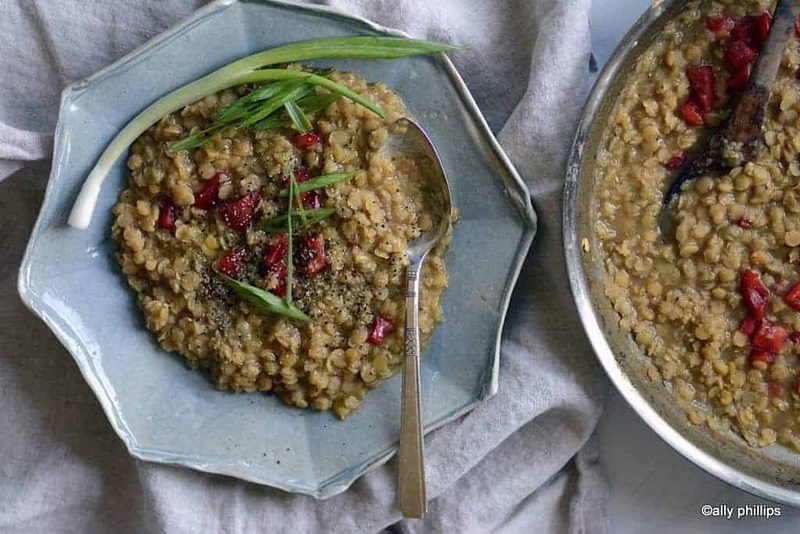 This recipe can be improvised in other ways, too. For instance, if you really don’t want to cook the chicken tenders, then buy a rotisserie deli chicken and slice nice juicy slices and put on the biscuit. If you don’t want to bake the biscuits, and, by the way, the frozen biscuits are just fabulous, then check your deli for biscuits already prepared. But, you don’t want to substitute annnneeeething for the mandarin mango chili lime sauce. It’s the glue that holds this entire recipe together and takes it to the next level. No cooking required. Just a food processor (and, I have a small food processor for small jobs like this). The sauce makes about one cup. Plenty for the chicken n’ biscuits. Another thing about this sauce, you can use it for other things! I mean it would be deeeelish on warm Udon noodles. Yes, you can buy those prepackaged, too. Saute some shrimp and throw it on top. Oh, lawsy, imagine the flavors. And, you’d have a full meal in under 15 minutes. You might want to make up the sauce a day early. For some reason, like many sauces, it just gets better on day two! SAUCE: Combine the mandarins in orange gel, mango chunks, salt, the juice/zest of one lime in a food processor. Pulse for about 30-45 seconds until it is a thick liquid mixture. Remove to a measuring cup, add the chili flakes, blend. Set aside. 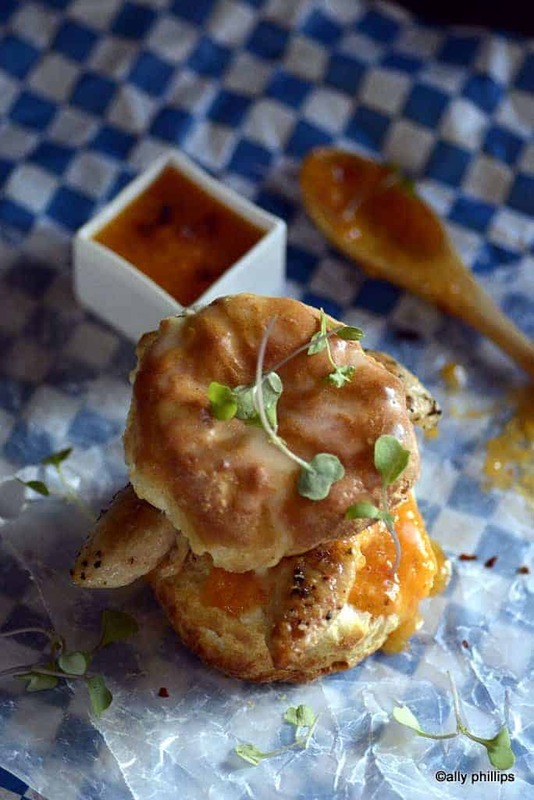 CHICKEN N’ BISCUITS: Heat a cast iron skillet on medium high heat. Let it get hot. Salt and pepper the chicken tenders. Coat the hot skillet with cooking spray. Put the tenders in. Pan sear and cook on each side about 4-5 minutes each (this will vary depending upon the thickness of the tenders). When done, set aside. Put six biscuits on a parchment paper lined cookie sheet. Cook according to package directions. When done, remove. Drizzle butter on the tops for more decadence. SERVING: Make six wedges of lime with the remaining lime or sprinkles of microgreens. Open each biscuit. Put a couple of tenders on the bottom piece. Add a heaping tablespoon of the sauce plus more for dipping. Put the top on. Serve with a wedge of lime. 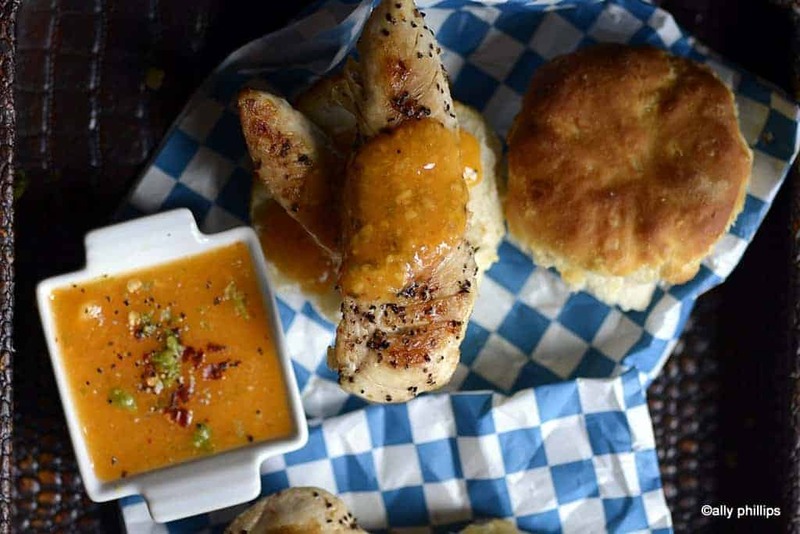 Eat immediately while you have that hot biscuit! I made the butter drizzle on top the baked biscuits optional. Your choice! I'm telling you, it's really good! Simple ingredients with a big flavor WOW. I love this.